As far as Europe goes, it’s the start of the cycling season, with most altitude camps focusing on base miles. But having raced in Australia for a month and a half already, you could almost call this Lucas Hamilton’s mid-season break. Bartali kicks off act II of Hamilton's season, his second in the World Tour with Mitchelton-SCOTT. Act I was pretty good, as he turned heads with a succession of impressive performances. A strong day at the National Road Race Championships produced a top 10 result, while he finished top 10 on GC at the Herald Sun tour having been given a protected role there. He really drew attention with a sparkling ride at the Tour Down Under though; a key cog in the Mitchelton-SCOTT machinery that delivered Daryl Impey to the top step of the podium, he received huge wraps from us here at SSS, the team, and Impey himself. After a Stagiaire role with Mitchelton-SCOTT in late 2017, Hamilton had grabbed a taste of the big time, but 2018 was still a year spent on the learning curve. Darryl Impey, Michael Albasini, Sam Bewley and Mat Hayman (who’s now part of management) are amongst the names he recounts as having taken him under their wing. The team too has aided his development, giving him a wide range of racing, allowing him to experience the full scope of pro racing in his first season. Consistent performances and his obvious potential were amongst the reasons the team gave him a ticket to the Tour Down Under. 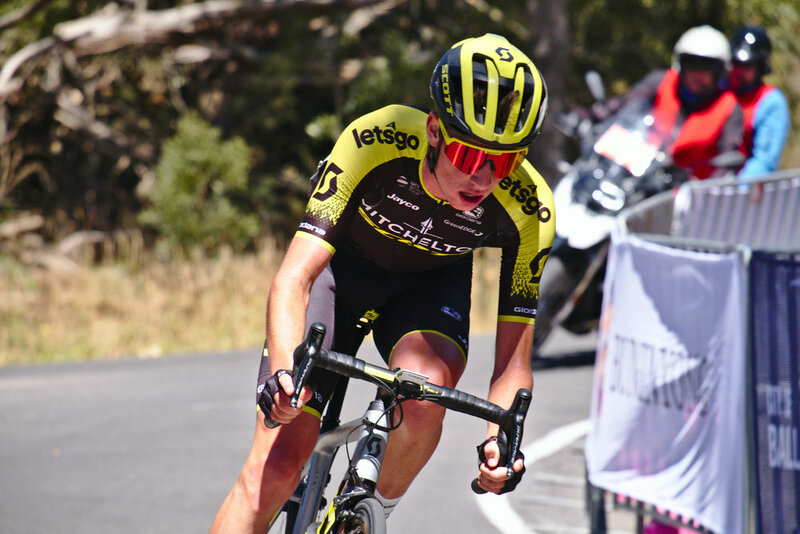 The team’s faith in him is obvious, as the only Aussie team at Australia’s only World Tour event, it’s safe to assume that there aren’t many places more coveted on Mitchelton-SCOTT than the seven starters at TDU... It’s also safe to assume he had little trouble getting up for the race. The professional cycling season seems to get longer and longer every year, and with Australians placing so much emphasis on this part of the year, there’s always the worry of overdoing it early and being cooked by the time the biggest Europeans races roll around. There’s a growing number of riders who don’t come back here in summer with that likely playing a role in the decision. Jack Haig, Simon Clarke and Michael Matthews are amongst our biggest names but didn’t race any of the Aussie Summer. But conversely, there’s no fun in playing catch up all year long either, especially if you’re an Australian who’s flown all the way out here, only to endure a dog of summer in front of your family and friends. So where’s the line? “As an Aussie, my personal choice is that I love going into Aus Summer… not in top form - I only had a month to prepare, because I finished racing in late October and didn’t start riding until November 20th – but I always find if you get there in January and you’re in pretty good shape, it’s a lot easier to stay on top of it all. According to Hamilton, that summer work ethic comes from a two-year period in the Australian U23 Program. The first, dogged by problems in the opening months, saw him struggling for form until late in the year. The second season was much smoother in the early months; as a result, he was needed to be all year long. So that’s the perfect start to this year then, and its set to be a busy one as more leadership opportunities come by. The big goal though is to start at a Grand Tour, the obvious next step in his evolution as a cyclist. In case you hadn’t noticed though, Grand Tour spots are hard to come by on the Mitchelton-SCOTT squad, they’ve got a pretty good team right now. Hence if he’s picked, it’s another sign of the team’s ever-growing faith in him. “I don’t think there will be a Grandy this year which we go to that we don’t want to win, and think we can win, because we’ve got the guys to do it. To get a Grand Tour spot will be good for the confidence, just knowing that the team thinks I can do a job.